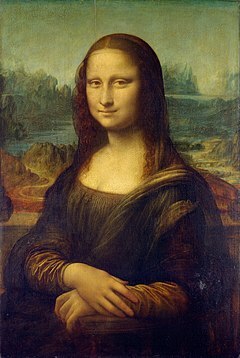 Borrowed from Italian Monna Lisa (literally “my lady Lisa”), named after Lisa del Giocondo, whom it portrays. […] found Florence Thompson, the Mona Lisa of the 1930s, a migrant mother whose picture haunted the nation. This small and deceptively simple, but extremely interesting molecular system was rightly characterized by Cram and coworkers as ‘The Mona Lisa of Organic Chemistry’, because of its ability to elicit wonder, to stimulate imagination and, last but not least, by its enigmatic elusiveness and numerous outstanding features. The panels depicting scenes from the life of Dionysos are framed with acanthus leaves, some of which form medallions, including one showing a fascinating woman who has come to be known as the Mona Lisa of Galilee.